I'm very excited to announce that one of my favorite linkups is getting a facelift for the New Year. If you've been blogging for a long, long, long time, you may remember Debbie McCormick of Wrinkled Mommy who started the Tuesday Archive Linkup (TALU), or Jana's Thinking Place who hosted the weekly Sunday Stream of Consciousness, and then there was the Monday Listicles blogger, who was so popular that she rarely got around to commenting on my posts, if ever. But they were fun to write and inspired some great writing. Those were the good ole' days. 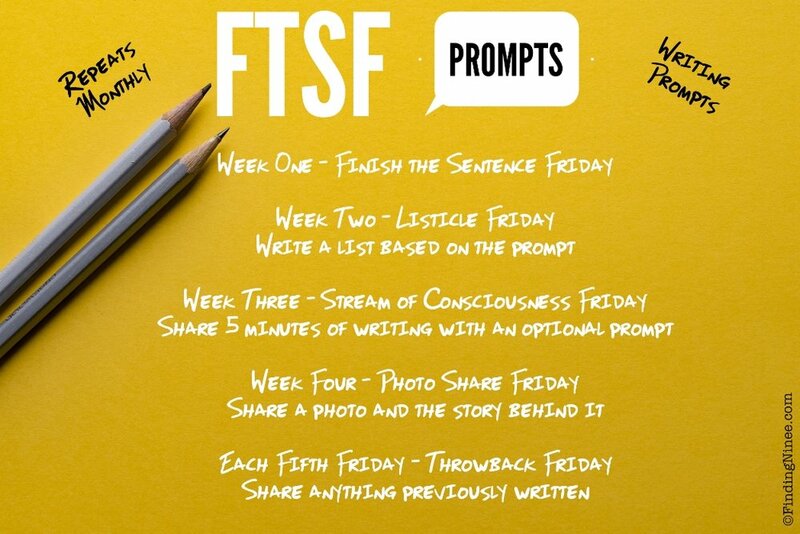 Finish the Sentence Friday (FTSF) is the only other writing prompt I participated in, that is still hanging in there from the good ole' days. FTSF was originally hosted by Stephanie Sprenger of Mommy, for Real, Janine Huldie of Confessions of a Mommyaholic and Kate Hall of Can I Get Another Bottle of Whine. Now Kristi Campbell of Finding Ninee is the remaining blogger in charge. I never found solid replacements for the other linkups, and over the years my writing has seriously slacked off because of it. She's the only blogger friend who I text behind the blog scenes. Most times it's in the winter when we're whining about school delays or no school but sometimes it leads to bright ideas. Yesterday we came up with this Friday's prompt, a listicle of sorts. I wrote mine this morning and through the listicle storytelling format, I missed old school blogging and felt like what I wrote today lit my heart with excitement. I said to myself, "I miss the old days of blogging." Heavy or not, it was fun, not a chore. I brainstormed for a while after writing my Friday post and then I sent Kristi a text that I had an idea. We just put this together TODAY. Friday posts will now have some old school variety. I feel like this is going to be good for all of us. Those of us who miss the simple lists, or the 5 minutes of stream of consciousness writing. Take your pick or participate in them all. I told Kristi I would commit to being her permanent cohost. So here I am with the announcement to tell you that we will start this week, January 11th - Week Two - with Listicle Friday. The prompt this week is 10 Favorite Things. Join the existing FTSF facebook group to find out what the weekly prompts will be and then link up anytime from Thursday night at 10pm through the weekend here or at Finding Ninee. I'm super excited and nervous to go from 27 posts in 2017 to at least 54 in 2018.